What is your edge ? BeautyEdge visited the NY NOW show in New York City's Jacob Javits Center. Some of you may be asking, “What is NY NOW?” From our point of view, it is a tremendous collection of U.S. and global-based manufacturers, exhibitors, and distributors with commercialized products that range from personal care to baby clothes, stationary to home goods. The exhibitors provide “first look” exposure to new launches along with their full brand line-ups that are available for retail sales in various selling channels. >>Though living green and sustainability are becoming more of a lifestyle than a trend, we continue discovering new ways to use our resources wisely and safely. >>Strong evidence in men’s luxury personal care was apparent, along with the need and clear message to love others and ourselves, to celebrate, to indulge in the little things and enjoy happiness. Take a look at what we saw at NY NOW! 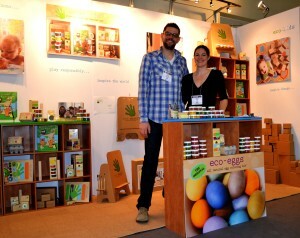 Although they have been around since 2008, Kip and Cammie Weeks continue to bring fun, creativity, and a breath of fresh air to a lineup of 13 eco-kid products, including molding dough, crayons, finger paints, and egg-coloring kits. The company began with a recipe for molding dough that Cammie Weeks’ mom made for her as a child. After incorporating natural ingredients into the recipe, the dough was named eco-dough. With the slogan “creative play the natural way,” eco-kids’ products are developed with non-toxic natural ingredients and packaged with environmentally friendly supplies from around the United States. 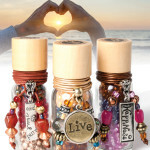 Bead Bottle is a distinctive and creative product that was designed to honor important memories and milestones in life. From family vacations to special friendships to personal mantras, Peyote Bird has developed numerous stores that appeal to a wide range of customers. 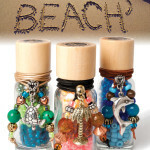 Each bead bottle contains various semi-precious stones, as well as metal charms, glass beads, and leather cording, accompanied by two lobster closures to make one necklace and one bracelet. A story card with simple instructions is provided with each purchase and includes a QR-code to YouTube videos for additional information. The time spent with these three sisters and founders—Regina, Cheryl, and Stephanie—was delightful. They are all experts in natural skin remedies, and two of the sisters are aestheticians. We’re happy to hear that, because it is particularly important to understand how a product works on skin and what to look for performance-wise during and after use. Buff Her House of Exfoliation is a collection of exfoliating facial scrubs made from organic and naturally grown fruits and vegetables. According to the company, these gentle exfoliants will restore your skin’s natural and radiant beauty with nature’s help! Their goal is to provide women with a natural way to exfoliate by using all-natural and organic foods. Each shaker is claimed to provide two hundred exfoliating applications, and can be used mixed with water, or added to your favorite cleanser! Final thoughts: As colleagues in marketing, product development, and trend seekers, explore with us these new ideas! Let's use these infusions of inspiration as stepping stones creating happiness for our consumers while designing a better world of products. Need help creating a Happy or Experiential beauty care product or brand with an edge? Connect with BeautyEdge LLC at Info@beautyedgeinc.com We’re also available for category analysis to identify the white space for your new product or brand. PRODUCT DEVELOPMENT - THE FIRST WIN! © Copyright 2006-2019 BeautyEdge LLC. All rights reserved. All logos, images and trademarks in this site are property of their respective owners.